A paralegal was forced to stop working in June 2016 as a result of a traumatic brain injury, cognitive impairments, and neck, hip and knee pain. She applied for Long Term disability benefits from Hartford but was denied because it was determined that she was never disabled and could perform her own occupation. The former paralegal retained Osterhout Berger and we agreed to represent her on a contingent basis. We immediately order the claim file and after a review noted that it failed to contain evidence from numerous physicians and an inadequate evaluation of our client’s functional limitations. We obtained medical treatment records from approximately seven different physicians, spoke with her treating doctors and had our client independently examined by a psychologist. We also obtained an evaluation from a vocational expert. Our reviewing our appeal, Hartford overturned its prior decision and noted that “based upon our review that included additional information received and generated on appeal, it was determined that the information in your client’s file supports her claim for Disability.” In light of this decision, our client received a large amount of past due benefits and she continues to receive benefits. 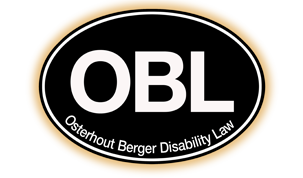 If you have had a similar situation and Hartford (or any insurance company) has denied your claim, please do not hesitate to contact Osterhout Berger Disability Law for a free consultation.